The goal in a Chapter 13 bankruptcy is to restructure a payment plan. If you can make and maintain timely payments, Chapter 13 allows you to retain property with significant equity, such as your automobile or home. Chapter 13 is intended for those who are struggling financially to maintain ownership of their property or have high household income. If you don’t take full advantage of a Bankruptcy Chapter 13, you run the risk of losing your home in a foreclosure process. A list of your current income and expenditures. A schedule of any loan contracts and unexpired leases. 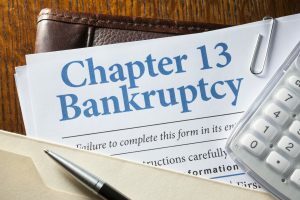 Chapter 13 bankruptcy allows you to keep your home or property and pay off your debts over a specific time period, usually three to five years. The repayment plan will be approved by the bankruptcy court if it complies with applicable Bankruptcy Law. There are many benefits to filing a Chapter 13 bankruptcy. We encourage you to call our law office today and talk to an experienced attorney. We will answer all of your questions and help you determine the best course of action. Call today for your phone consultation and let us help you get your life back under control.